Welcome to Marvel Strike Force Heroes page. This is the full description of MSF Carnage stats, skills and abilities. Carnage is a Spider-Verse Villain who shreds through his enemies with ferocious attacks and feeds his anger on their pain and suffering. His first skill inflicts medium damage to the primary target and if that target has negative effects spread those effects to 1-2 adjacent targets and chain a small amount of damage. His second skill inflicts heavy damage to primary target depending on the number of negative effects but also removes all those effects. Additionally, it strikes adjacent targets for a medium amount of damage. Carnage ultimate delivers massive damage to the primary target and applies 2 Bleed for 2 turns (if the target is above 50% HP, applies additional Bleed). Carnage passive ability fills his Speed Bar and heals him for 10% of HP when the enemy’s HP is under 25%. Carnage damage output is enormous and he will definitely change the current game balance, especially because of his Speed and Health. Carnage will obviously work best with Venom and the rest of Spider-Verse but he could be a great asset in any squad filled with Heroes who can apply negative effects (Quake, Pyro, etc..). Because of all these reasons, his price is 100 shards which are through offers, Psychotic Orbs and Alliance War Store. Carnage is an insane brawler that viciously tears through foes with negative effects, attacking more frequently as their health decreases. Attack the primary target for 110% damage. IF the primary target has a negative effect, Chain to 1-2 adjacent targets for 90% damage. Counter Attack breaks this Chain. Attack primary target for 100% damage +50% additional damage per negative effect. Remove all negative effects from the primary target. Attack all adjacent targets for 60% damage. Attack primary target for 100% Piercing + apply Bleed. When an enemy drops below 25% Health, Fill Speed Bar by 10% + Heal for 5% of this character’s Max Health. Total capability to withstand damage. Reduces incoming damage by this amount. Capability to apply effects to the target. Extra damage inflicted when a critical hit is scored. Chance to trigger a critical hit with most attacks. Fills speed bar and determines the order in which characters act. Base chance to avoid an incoming attack. Chance to block most attacks. Chance to hit the target with most attacks. 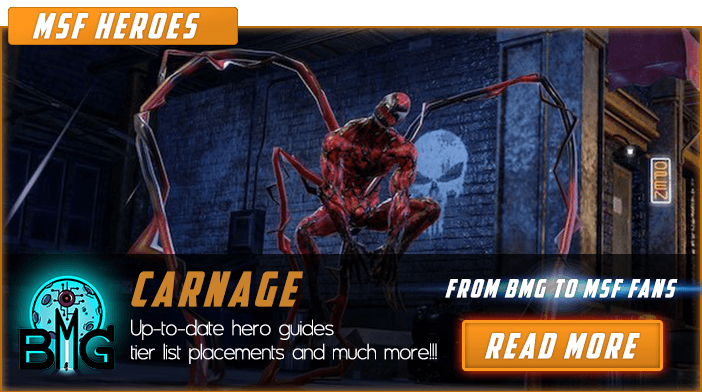 We hope that you enjoyed the description of MSF Hero Carnage. For detailed information about other MSF Characters check our MSF Heroes page.